Most people associate the brandname of Hercules with video cards. But in November 1999 Hercules was purchased by Guillemot Corp., a well known manufacturer of game and audio attachments for computers and game consoles. 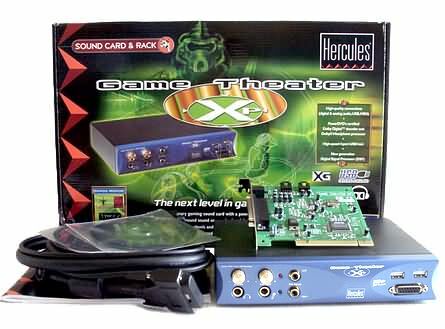 As a result of such amalgamation the market has received a sound card called "Game Theater XP" - the hero of our today's review. The managers of Guillemot have decided to use a renowned brand-name instead of the name of their own company. The manufacturer intends the card for a wide circle of PC users - from hard-core gamers to "home theater-lovers". The developers of this card tried to satisfy all the demands of gamers, first of all, as far as functionality and convenience are concerned. Let's examine this card and check whether it justifies its $200 price tag. Gilded adapter "stereo jack - stereo mini jack". This PCI sound card surprises me with its small dimensions and the absence of a heap of connectors. There are only a 44-pin connector for the cable and a line-in mini jack. It is quite rational that internal connectors, but CD_IN and AUX2_IN, are taken away since they are rarely used. By the way, a couple of years ago the absence of an internal connector 'CD Digital in' could be considered as a disadvantage of the card, but today a great bulk of CD/DVD ROM drives can read CD-DA discs via IDE bus. And the software support is provided by WMP of the 7th version, WinAmp via its plug-in CD Reader. In W2K such support is organized on the OS level. This connector can be useful only for connecting with another sound card, but gamers and theater-lovers are hardly interested in it. 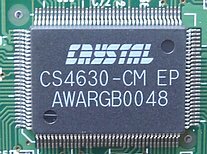 Well, it is our old fellow - the CS4630 processor from Crystal Semiconductor. Many of you might remember it from the Santa Cruz review (there was a lot of criticism towards the card taking into consideration its price and destination, but a bit later the Santa's drivers were reworked, and starting from the 4071 version the card works, at least, stable). fixed 48 KHz S/PDIF out. The card is furnished with two 4-channel codecs - the CS4294-JQ from Crystal Semiconductor. 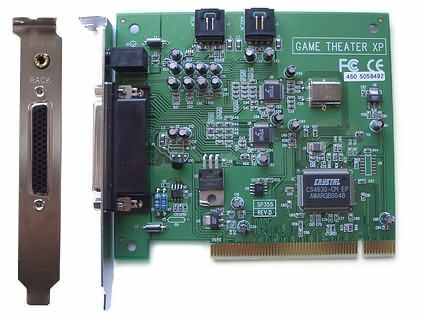 The card lacks for a "professional 20-bit sound", but it is a good solution as a game card with elements of a home theater. The listening tests below are going to show the real sounding of the card. Look at the full-sized (1/4") phones and mic jacks. 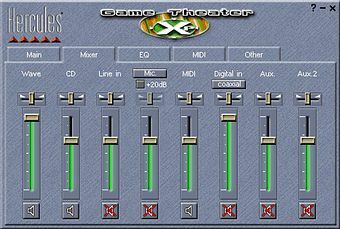 The second line-in (the first one is on the card) is combined with a mic input. In the extreme position of the mic's signal amplification regulator the switch shifts an electric circuit to the line-in (two gilded connectors). Besides, on the front panel of the external module there are 2 USB connectors and one standard Game/Joystick one. Output RCA connectors for an active acoustic system are duplicated with minijacks, unlike the center and the subwoofer. The USB hub is introduced with two connectors on the front panel (1,2) and two on the rear one (3,4). The digital input and output are made both in coaxial electrical and optical implementation. For connection of MIDI/MP3 keyboards and synthesizers there are standard 5-pin DIN connectors. On the top cover of the unit is an emblem of the penguin (Guillemot's logo). A big metallic case (well-shielded) stands on 4 plastic legs. The case is very difficult to disassemble; there are more than twenty bolts inside and outside. Inside there is a great deal of buffering elements and amplifiers. There are no any DACs or ACDs, and all the codecs are located on the card. It should be noted that a normal scheme with a transformer is realized for RCA S/PDIF inputs and outputs, it provides a standard signal level and galvanic decoupling. the SB Live! 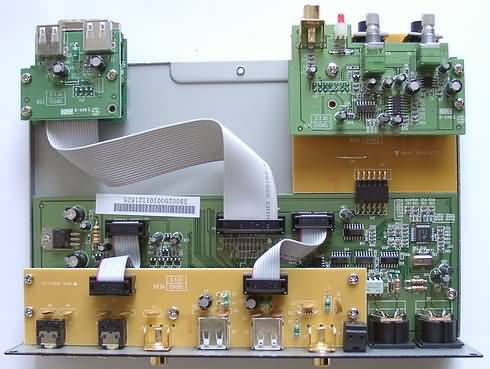 Player 5.1 sound card (EMU10K), digital coaxial interface (S/PDIF). The tests were run under the Win9x operating system with installed DirectX 8.0a. ACID Express - a multitrack audio editor for creation of your own compositions of musical fragments (loops). The "Mixer" allows to adjust volume levels of different channels, and choose a source of the digital signal: optical or electrical RCA connector. EQ is a hardware 10-band equalizer. There are 8 presets and manual adjustment. The MIDI parameters are adjusted in the "MIDI" bookmark. 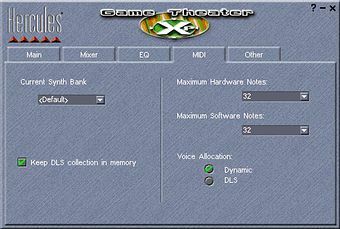 You can choose your own DLS bank and adjust the number of hardware and soft MIDI voices. The last bookmark is meant for adjustment of hardware acceleration for Sensaura, DirectSound 3D and MP3 algorithms, enabling of stereo base extension function, echoes suppression mode for teleconferences, and adjustment of digital output operation. In the review on the Santa Cruz I mentioned that I didn't feel any acceleration of MP3 since I used only WinAmp, AudioStation and Windows Media Player 7.0, and this feature of the CS4630 processor is available only with a special filter in use - DirectShow. Let's look at the option File/Properties/Advanced of Windows Media Player v.6.4.07.1112 from the standard complete set of Win98SE. Live 5.1 (with Fraunhofer filter) ~8%. Well, the acceleration does really take place here. But don't we lose in quality? My conclusion is that highs and middles have become a bit metallic. For acoustic systems cheaper than $200 it may be unimportant. Creative SB Live! Player 5.1 ~5%. The sound was very close to that of WMP6 with Fraunhofer filter. As for the usage of the DirectSound plug-in in WinAmp - the high-pitched jingling makes its utilization unacceptable on more or less good equipment. Since our digital measurements has gained some weight and they may interest not all of our readers, we have taken them out into a separate page. I recommend to read it! We were listening to the card's performance with the usage of the F&D IHOO 5.1 (active acoustic system) and the Philips HP600 headphones. As test compositions we used music of different genres, mainly from CD-DAs. Since most of you have lots of MP3 compositions, such files are compulsory participants in our tests of any audio equipment. In this case MP3 files are used to define the quality of operation of an integrated equalizer in real conditions. 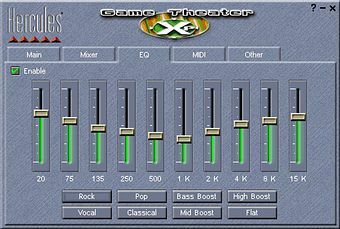 The sound of all modern PCI sound cards, including the Hercules Game Theater XP, satisfies 90% of PC users. Among the remaining 10% there are not many people who have Hi-Fi equipment to notice the difference in sound among different sound cards. Even with such good speakers as the IHOO 5.1 you should listen very carefully in order to feel the difference between the Live! Player 5.1 and the Hercules Game Theater XP. Hercules's card has some peculiar timbre which might please you with its transparent highs and some synthetic sound. In my opinion, it sounds similar to the Live! Player 5.1 / Live! Platinum 5.1 cards. The Hercules Game Theater XP is a good choice for listening to Techno/Pop/Rock compositions. Many people use music as a light background during their work or rest, which is quite natural. For real music lovers the built-in codecs of common sound cards are not suitable. They need, at least, external high-quality converters. And the Hercules Game Theater XP offers a complete set of digital interfaces. An equalizer built in the control panel of the Hercules is not that bad. It easily outweighs both the imperfection of the sound source (e.g. of an MP3 file), and of the reproducing equipment (e.g. computer sets poor in basses). It is much better in quality than WinAmp's equalizer: it doesn't spoil or flatten the sound. Listening with headphones is rational to be made via a special connector on the front panel of the external module. Unlike the line-out, you can feel an electric coherence of the output with 32-Ohm headphones, and the sound has a very pleasant timbre. We were listening to movies and trailers with a soundtrack coded in Dolby Pro Logic, Dolby Digital, DTS formats. The sound quality is quite decent (much better than that of cheap 5.1 cards based on the ForteMedia FM801, somewhere at the same level with the Live! ), the channels' volume level is easy to control from the proprietary control panel. Besides, there is also something for 4-channel acoustic system owners. After choosing the 4 Speaker Output mode, the signal undergoes downmixing from 6 to 4 channels. And if you have connected an external decoder (e.g. for movies with DTS tracks), you should choose "Use S/PDIF Output". Q3A NVIDIA demo - special levels for Q3A from NVIDIA. In games we have encountered one interesting peculiarity. Since the card has 3D sound positioning algorithms based on Sensaura technologies, including MultiDrive, there are only 4 working speakers in games: front and rear. The center and subwoofer unfortunately "keep silence". It is good if you speaker set allows to direct the signal to subwoofer, or (like in our case with the IHOO 5.1) the front and rear speakers are full-frequency devices. And what if not? Without a subwoofer the sound in games becomes much poorer. dated 17.04.2001, the situation hasn't changed. 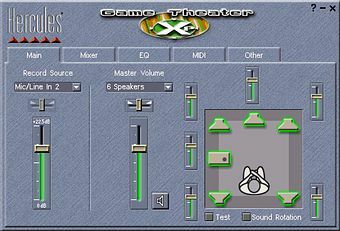 Note that 6-channel cards based on the Q3D API (the FM801) and EAX2.0 API (the Live!5.1) haven't got such problems: the sound in games is coming out of all 6 speakers. Nevertheless, Sensaura sounds quite good. Many consider that Sensaura EnvironmentFX™ sounds even better than EAX 2.0. I would say it sounds a bit different, it has some peculiar nuances. As for MacroFX™ and ZoomFX™ technologies, their realization in the form of DS3D extensions makes their usage in the program difficult (awkward). I don't know any games supporting these technologies, except the demo-program from Sensaura. But the recent signing of the agreement on licensing of Sensaura algorithms for the upcoming X-Box from Microsoft makes me feel optimistic. 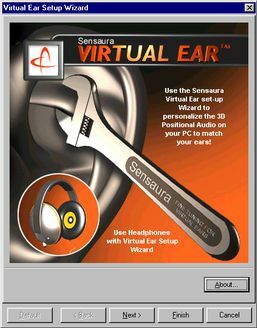 By the way, the card is supplied with a very interesting utility - Sensaura Virtual Ear. And while for other sound cards (for example, the YMF 7x4) it is offered as a paid upgrade, here everything is included in the price of the card. 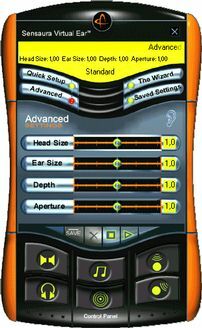 It allows to adjust the card for a definite person's ears in order to reach the most realistic audio 3D positioning. I've tried this technology, but felt almost no improvements. 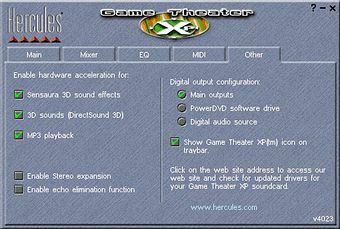 The Hercules Game Theater XP is a stylish and interesting solution for an advanced user. digital coaxial and optical inputs and outputs. lack of a remote control.